Designing such a light, so that it gives me the intensity I want, with the spectrum I like, is just complicated enough to enjoy doing! Fortunately, Finnex LED lights are enough like SMD LED tape lights for their data to be useful. And, over the past few years I have done enough PAR measuring with that type of LEDs to have some useful data, too. So far, none of the lights I have made with SMD LEDs have given the intensity I designed for, so, for this one I will try to make better use of the data. 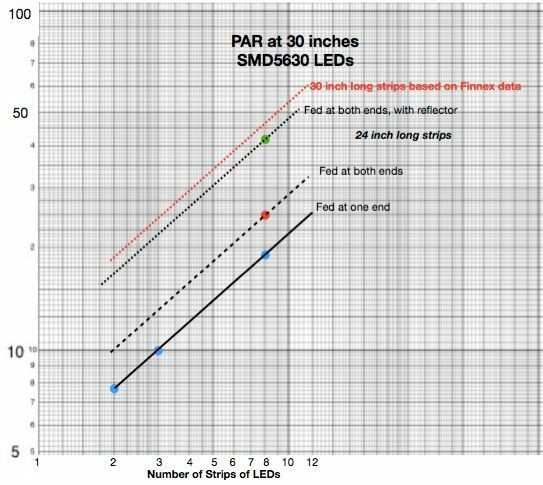 This is important because the data I have for the SMD LED tape I want to use if from a 24 inch long light, but I need a 16 inch long light, so I need to be able to adjust the data. 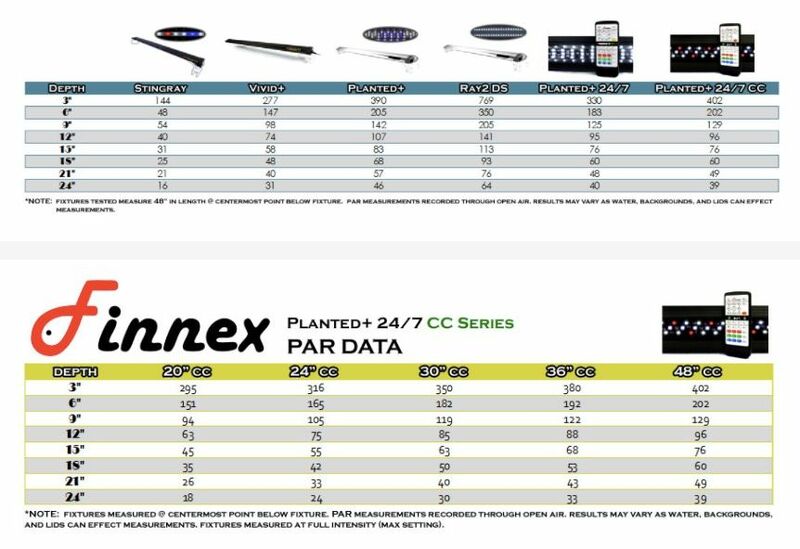 Finnex LED lights use SMD LEDs, so we can use the data they supply to figure out things like how does the length of a SMD light affect the PAR it produces. This shows that data plotted so it is useful for a LED light of about the size I want to make. The intensity of the light we get from any light fixture drops with distance from the light. This shows how much the intensity drops for a 20 inch Finnex light, which should be close to how much a 16 inch light will drop in intensity. 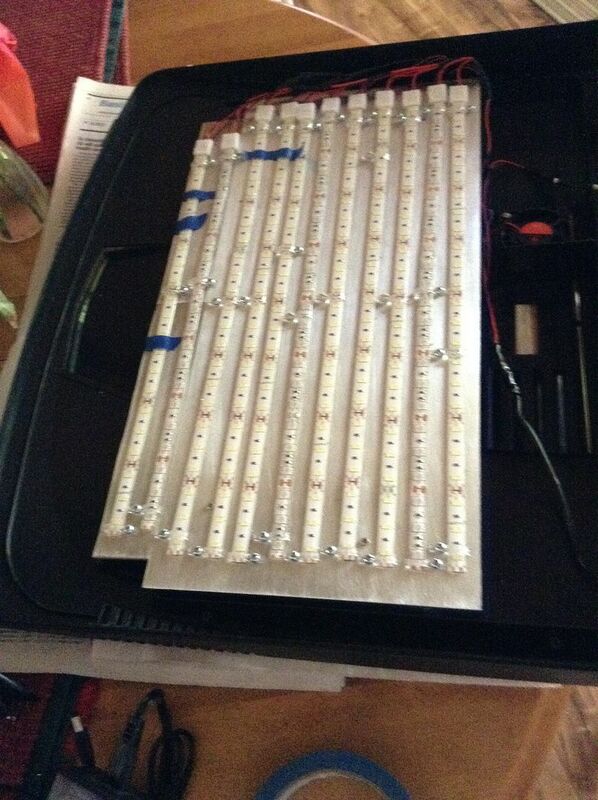 I have some data for a SMD light I made that was 24 inches long, measured at 33 inches distance. To determine how much light that fixture would have produced at 17 inches, the distance my new light will be from the substrate, first I need to find the ratio of intensity at about 18 inches distance for the Finnex light at 17 inches vs. what it is at 33 inches. That is about 4 to 1. Next, I need to find the ratio for the light produced by the Finnex lights with a length of 18 inches. That is about 32/50, or .64. So, if I multiply those two ratios I should have a good approximation of how much to adjust my data for my older 24 inch SMD light to make it applicable to the new light I want to make. That is 4 x .64, or 2.6 to 1. I got about 25 PAR at 33 inches, so that means for a similar light, 16 inches long and 17 inches from the substrate I should get about 25 x 2.6 or 65 PAR. What about SMD degradation over time? Loss of PAR? I'm hoping to have more than enough light initially, with a dimmer to reduce it as needed. That should extend the time the light will be effective. And, I'm thinking about using a much better heatsink than I used before, so the operating temperature, which is what deteriorates the LEDs, will be lower. 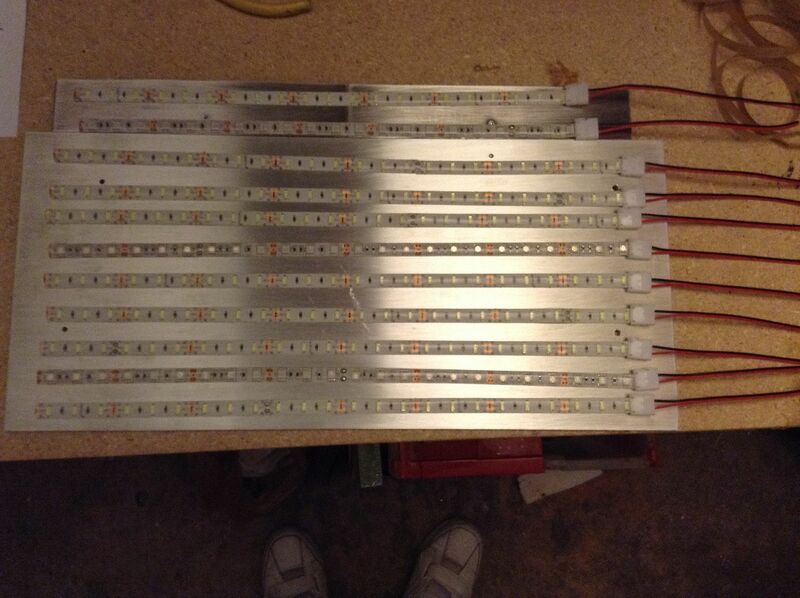 One more parameter, that will affect the light intensity, is the number of rows of LEDs I use. This is some data I got from similar LEDs, where I measured PAR for several different numbers of rows. If I increase the number of rows from 8 to 10, I should get about 10% more PAR, which would increase the intensity from about 65 to about 70 PAR. Or, if I can use 12 rows, it increases it by about 25%, increasing the PAR from about 65 to about 80. Until I figure out the heatsink configuration I can't decide how many rows I will use. EDIT: I don't feel confident about my calculated PAR, so I redid it, using my measured PAR at a much closer distance from the light, 22 inches, instead of 33 inches. That calculation gives me about 45 PAR at the substrate, if I use 10 rows of LEDs, or 50 PAR if I use 12 rows of LEDs. That seems more probable to me, and it is just slightly less than I hoped for. Now I feel a lot more confident. I visited Blue Collar Supply to look for something to use for a heat sink. And, I found pieces 8" x 24" of 1/8 inch thick aluminum plates for $8 each. I trimmed it down to 8" x 17 1/2 inches, and used the same screws to hold it in place. 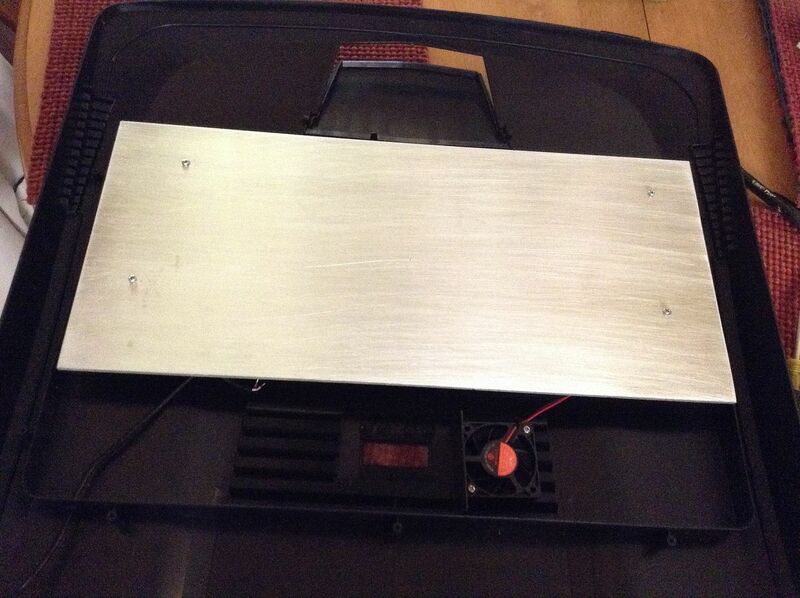 To get 2 more rows of LEDs I added another 1.5 inches of heatsink. Instead of having to struggle with soldering wires to the strips I used clamp on connections. Next step is to attach screw on clips to help hold the LED strips attached to the heatsink. 33 holes drilled, for 33 screw/nuts to hold 33 little clamps in place to help prevent the strips from coming loose from the heatsink. 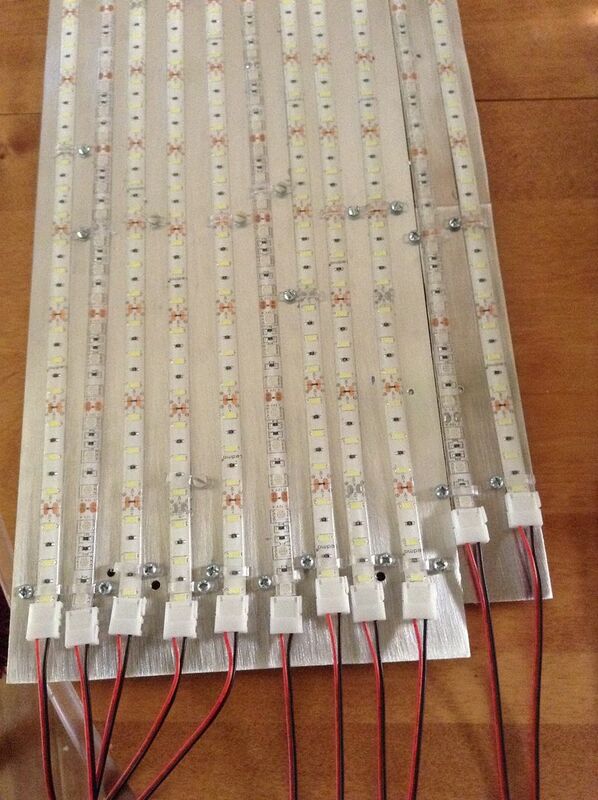 This method for wiring the LED strips is much easier than soldering wires to the tiny solder pads. Now to connect all of the red wires together, and all of the black wires together, and connect the paralleled wires to the power supply (12 VDC, 5 amp power supply). It is now fully assembled - almost. The solderless connectors are not as good as they should be. I used 11 of them and 3 of those worked only intermittently until I readjusted them several times. I'm hoping they are stable now. The little plastic clips that hold the tape to the heatsink seem to work well, and they also prevent you from mounting the tapes too close together. But, the continuing problem I have with these tapes is the low quality adhesive tape they use. I sanded the heatsink, washed it at least 3 times with alcohol, and once with soap and water. Still, the tapes don't adhere well with the heatsink. I'm going to use silicone caulk to ensure that the tapes stay where they belong, which shouldn't be necessary, but it does work well. Tomorrow I apply the silicone caulk, and on Sunday I will probably set it on the tank and measure how much PAR I get. hoppycalif--mad lighting genius of APC!